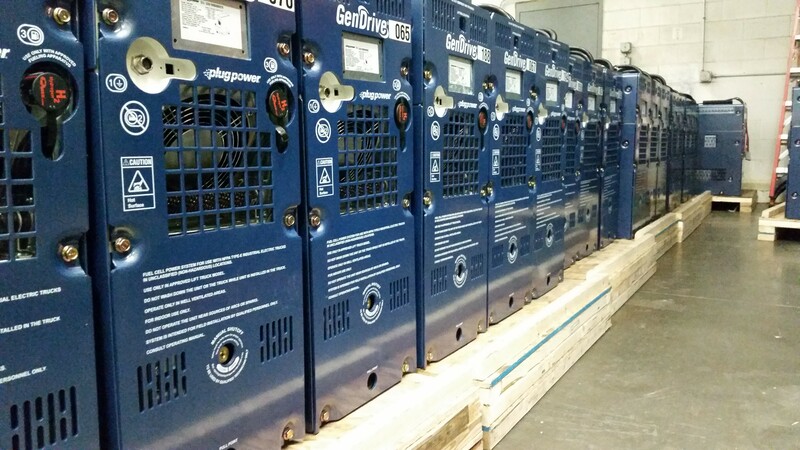 Plug Power’s GenDrive system integrates fuel cells manufactured by both Plug Power and Ballard Power and incorporates a hydrogen storage system that allows the system to “recharge” in a matter of minutes as opposed to several hours for lead-acid batteries. It allows hydrogen-powered forklifts to run at a constant steady power compared to conventional batteries, which experience “droop” in their output towards the end of a shift. GenDrive units occupy the same space designed for conventional batteries.